The photograph from which the logo is derived was taken on Long Island ME on the night we celebrated Amy’s forty six birthday – The Moon and how it marvels had always held a great fascination for Amy – each year and with every new calendar, she would write the name of the full Moon as it corresponded to the month – The Wolf Moon for January – The Snow Moon for February and so on. The full Moon in August is known as the Sturgeon Moon – or with some Native American tribes..the Red Moon – because as the Moon rises, it will appear reddish if there is any sultry haze and so Red Moon was the one she preferred and what she would write in for the month of August. This day and that night of August 9, 2006 could not have been more perfect – many of the people that Amy loved most were there – we feasted on lobsters that had been plucked from the sea that very morning (we had watched it happen, in fact) …..We played games on the lawn that stretched to rock and to water – one was a silly little round of touch football played with a boat bumper that had washed up on shore and is still now in my possession – we muddled mint in tall glasses with sugar, added ice and then poured over rum – and we had laughed… oh, how we laughed. The Moon that rose that night was a Red Moon and came up in such a way that it lit a path along the water -tiny sparkling lights which danced along the top of the waves- it was so large and hung so low on the horizon it was as if you could walk out and touch it. For those of us there, in the midst of all that beauty, in all the magic of a perfect day, what was not lost was the fact that Amy was terminally ill and I am sure every one of us gave pause as to whether this was the last of her birthdays that we would celebrate with her among us. 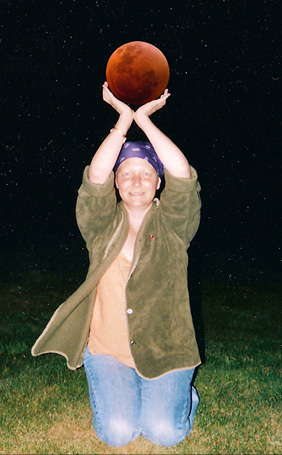 Amy, a cancer wearing away at her body but never penetrating her lyrical and joyous soul, was the first to hold out her hand – the first to drop to her knees and lift the moon above her head. “How many people can say they’ve lived long enough to hold the Moon in their hands?” she had laughed. Exactly thirteen full Moons later, in the early morning hours of a September Corn Moon, Amy passed away- and so we chose this image as our logo to represent Amy’s Treat because it most embodies her amazing spirit, her humor and her indomitable sense of wonder.